One of my new resolution for 2014 was – show people my work and clarify info and website, personalize all details for each group. After years of working in this industry….I noticed that probably my classic, bridal and party make-up and hairstyles aren’t visible that much as should be…all getting lost within my creative, avant-garde make-up’s and styling. I really wanted to provide proper info for clients and get easier to go trough all my work! That why last week was launched my new website and facebook page! All about my service – Whether it’s your wedding, prom ball, event, party or even personal photoshoots e.g. family, boudoir, pregnancy – every one of us wants to look gorgeous, flawless, feel beautiful and confident. Sometimes it is one of the biggest and most important days of our live…so we all want to be photo-ready for every picture in their Big Day. I offer service for Wedding and Party Make-up & Hair styling across West Yorkshire. ‘Beauty and Bridal’ offers service within fallowing areas: Bradford – Leeds – Morley – Batley – Dewsbury – Wakefield – Heckmodwike – Huddersfield – Halifax – Brighouse – Pontefract – Castelford. Service for other areas is also possible, prices may be updated about travel costs (petrol/train/bus). Full price list can be found here http://www.beautyandbride.co.uk/price-list/ . For Quotes and bookings – fell free to get in touch with me via email, contact form on website, or my any other social page. Also my page www.dorotamua.com would receive proper ‘lifting’, alternation and clear info about my professional service for photographers, models etc. – this should be done within next month…. Many of you keep asking : Why make-up cost that much?? Is the make-up artist for my wedding ripping me off? If you’ve never had to inquire about having your make-up professionally done, you may find these make-up prices to be somewhat steep. And you are probably thinking this make-up artist has got to be trying to rip you off, and you are determined to find someone with lower pricing. Luxury: On location beauty services are considered a luxury service. I will be packing up and transporting bags of equipment and supplies directly to you in the comfort of your home, bridal suite or hotel, on demand at the hour you specify – Yes, I bring my service to you! Make-up Artists are carrying extra items such a safety pins, pain killers, plasters, hairspray, nail polish, even nail glue and antiperspirant – so we become invaluable help in emergency situation for You, bridesmaids or your guests! B) The costs of insurance, advertising, website costs – although as far as I know – that not every MUA is insured! 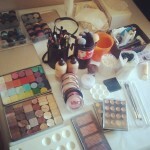 Make-up Artist that provides good/high quality service should be insured! Time: Aside from providing services on the day of, I will try skincare/make-up advice, taking your emails, sms/calls to answer any questions. Your schedule becomes mine; if you have an early start in the morning, I have an even earlier start! Wake-up, shower, breakfast (it’s human thing, right?! ), most important double checking entire kit and all items. Getting out far earlier to avoid the biggest traffic jams… All of the time until your B’Day is spent reviewing your Idea boards, discussing styling options, providing skin care suggestions, going over scheduling, coordinating, is time “on the clock” where I am devoting my attention to you. All that means – You are receiving a customized service. Believe me, it is all TIME, and not just the time that you’re sitting in the chair having your make-up and hair done. Ultimately, it is my job. Try to look at our work from other point of view – Do you ask your electrical or plumber to make service for free or £5??? I doubt…Everyone deserves to get paid for their job, right? Make-up artists have bills and living expenses, the same as anyone else. Well sought after industry professionals: £100-£300+ /pp – and in some cases upward of £500 for some celebrity artists. Well, if the make-up side of your wedding (or any other event) really is not important to you, and you really cannot determine the difference between a regular make-up artist and an AWESOME make-up artist, or the quality of make-up, then yes, definitely go for your budget end make-up artists! Definitely, most brides will want to look the absolute best on their wedding day! Just remember the Make-up Artist plays an important role in how you will look on your big day (and the years later as documented in ALL your photographs!). If you are very particular, and only want to look the very best for your event AND in your photos, then please do remember that good quality Make-up Artists, come at a price – they’re not just “trying to rip you off”, but see it as getting yourself a high end service (and a peace of mind). Each and every wedding can make or break our reputation. We worry about what can go wrong and we sweat the details because it’s our responsibility. If we mess something up, we know that in the age of viral sharing on the internet, it may very well destroy our business. If something go wrong e.g. we stuck in traffic jam – it’s extremely stressful, as we don’t want disappoint any of you! Please do not expect your Make-up Artist (photographer, videographer, wedding coordinator or anyone for that matter) to cost match or greatly reduce their service price because you don’t want to spend the extra money… To put it simply, you can’t expect a service, if you aren’t willing to pay for it! If you see extremely chap/low offer… It does not mean you get a better treatment ar the same service as normally offered in regular price! Its cheaper for a reason…. Planning a wedding is never an inexpensive venture! Sure, you can cut corners and do without, but when you are looking to hire a professionals, keep in mind you must pay appropriately for these services. And please don’t ask any Make-up artist to lower all costs for receiving pictures of you after creating make-up and from your wedding – this can be taken very offensive – its not much beneficial for our portfolio…and even more > Make-up artist have to respect your privacy, so to us – in some cases… it’s absolutely wrong even ask our Bride about any pictures! – Even if we create best look in our carrier! Make-up artistry is my business. And I set a fair pricing for my expertise and prefer not to waiver from these amounts. It’s difficult to drop the rate for one client and have it get around, and I may end up having to offer lower rates for everyone. Charging below the standard also kills the industry. If I would charge too low for a long time – It may cost me to loose my work as Make-up Artist – simply because I would not be able to afford and stock my kit in best products and tools any more! I do not go for quantity, I am interested in quality! Therefore, my rates are set at a reasonable price that is impartial and honest for every client. Thank you so much for this post Dorota. As a new makeup artist trying to get into the industry I have come across several brides who think they can take advantage. One bride asked me for a quote said she would contact me and didn’t, only to hear from her several months later trying to reduce my quote by a considerable amount. I explained to her that not only is she too late to book but I wouldn’t even be able to afford the makeup to put on her face at that amount!